Screw up your eyes and look hard. 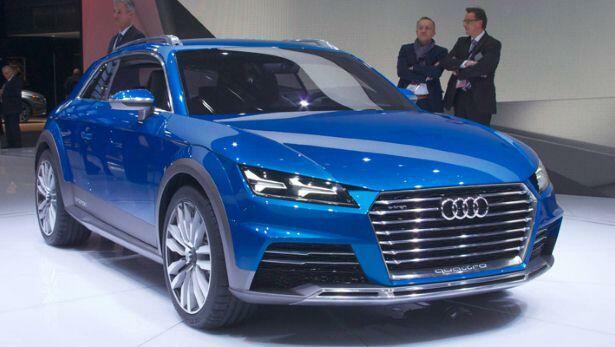 This is the new Audi TT. Well, sorta. Take away the 'Allroad' lower-body cladding, and forget the shooting-brake tail. Put on the usual TT sloping hatchback. Now you see, the new TT. The real thing will be launched later this year, but in the meantime Audi is decorating its Detroit stand with this Allroad Shooting Brake. It has the interior of the new TT too - the one they showed at the CES last week. Audi has previous on this. You might remember in 2005, the four-ring tribe did a shooting brake concept version of the second-generation TT at the Tokyo Show, before the launch of the real roadster and coupe. Back then we wondered if a shooting brake would ever become the TT's third production bodystyle. But no. He made it clear this is in addition to the more conventional upcoming A1-sized five-door crossover (likely called Q2) which is already signed off for production in 2016. The show car is ruddy fast. It uses the S3's 2.0TFSi engine of 292bhp. It also gets a hybrid motor between the engine and the S-Tronic transmission. That combo drives the front wheels only, but besides that, there's also another electric motor for the rear wheels. In total the system has a 408bhp output, so Audi reckons it can do 0-100 in 4.6sec. The concept has a battery big enough to be charged from the mains, giving it 50 kilometres of electric-only 4WD range. That also means 52kpl in the official cycle, if not the real world when you're laying down your four-and-a-half-second 0-100s. Encouragingly Hackenberg hints at other more speedy expansions to the TT range too. He says RS models are becoming more important for Audi and that they will happen on almost every Audi model line. So we can take it that a TT RS is a given. We also ask him about a lightweight-special TT. He answers that because the TT uses the MQB matrix, it's possible to mix in ultra-light components including a carbonfibre roof, all built in on the main production line, to get the kilos off. 'I can imagine that car as a limited series,' he says. Good.